Gallombares | LOS GALLOMBARES COOPERATES IN THE XXI LONG DISTANCE RACE OF HUÈTOR TÁJAR (PRUEBA DE FONDO EL ‘ESPÁRRAGO – VILLA DE HUÉTOR TÁJAR’). THIS COMPETITION AWARDS WINNERS THEIR WEIGHT IN ASPARAGUS. This Saturday (26th May), this important sports event, famous in Granada, takes place. 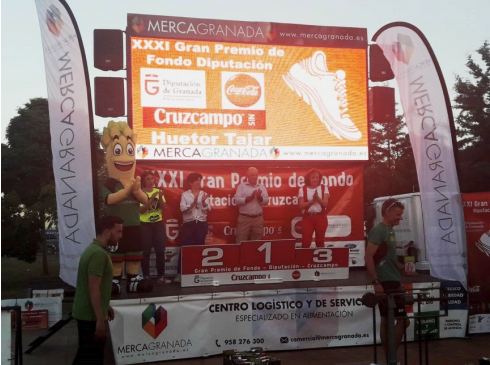 Every year, more and more participants participate in this event, with more than one thousand runners coming from many towns in Granada and nearby cities. It takes place in Huetor-Tajar and participants run a distance of 10 km approximately. It is organized by Diputación de Granada and Huetor Tajar Town Hall. It is composed by the 31st cross-country track circuit and Cruzcampo. Besides these institutions, they also count on the collaboration of Granada delegation of the Athleticism Federation in Andalucia. Los Gallombares as well as some other cooperatives in the area has always wanted to participate in this special event with the collaboration of 500kg of green asparagus to be distributed among the race participants and the winners. Our pet ESPARRAGUÍN was there encouraging the participants and living up the race for the participants and their families. Its presence made the awards ceremony cheerful and enjoyable.